Registration: Sorry, registration for this event has been closed. For more info, call 208-466-4641. 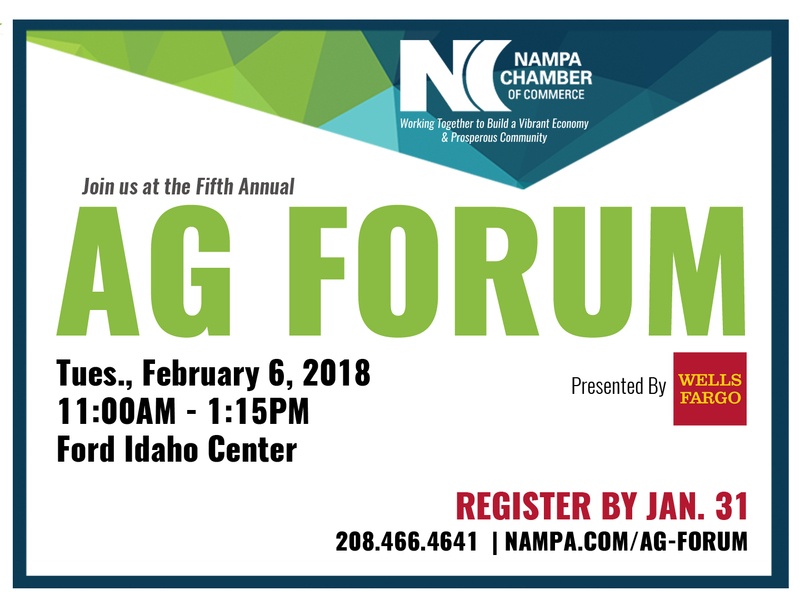 Join us Tues., Feb. 6, 2018 at the Ford Idaho Center from 11:00am-1:15pm to celebrate agriculture in the Treasure Valley. Sponsorship/Exhibitor Opportunities: Table Sponsorships $350 (8 tickets). Exhibitor opportunities at $200. Table sponsor and exhibitor pricing $400 ($100 savings). For sponsor opportunities, contact Steve Weston (sweston@nampa.com/208-466-4641). Reservations are required by 5:00pm on Wed., Jan. 31, 2018. In order to control costs, cancelations after this time and all luncheon reservations will be charged for a lunch regardless of attendance. Thank you for your understanding. Note: Lunch Punch VIP passes are not available to use for the Ag Forum.